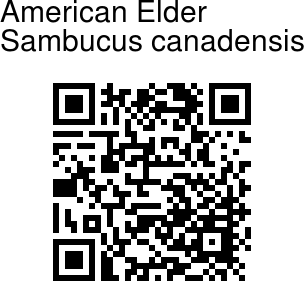 American elder is a bushy, multi-stemmed, wide spreading shrub with deciduous compound leaves. It gets 3-4 m tall with a similar spread, and its brittle branches are pithy and soft. Elderberry often forms dense thickets, because of "suckers" produced from the roots. The leaves are opposite, compound, up to a foot long. There are 5, 7 or 9 saw toothed leaflets, each about 2-6 in long. The lowest leaflets are often lobed. The star shaped white flowers are tiny, but arranged in showy sprays up to 10 in across. The flat-topped circular or domed flower clusters can be very abundant. The edible fruits are shiny blue-black drupes with 3-5 stoney seeds. They are 0.3-0.6 cm in diameter. 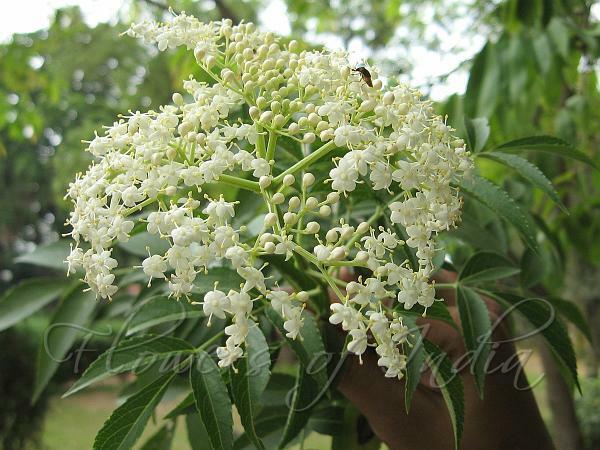 American elder is native to North America, naturalized in many parts of India, particularly the Himalayas. It is also grown as an ornamental plant. Flowering: May-September. Photographed in Karnataka, Maharashtra, Manipur.